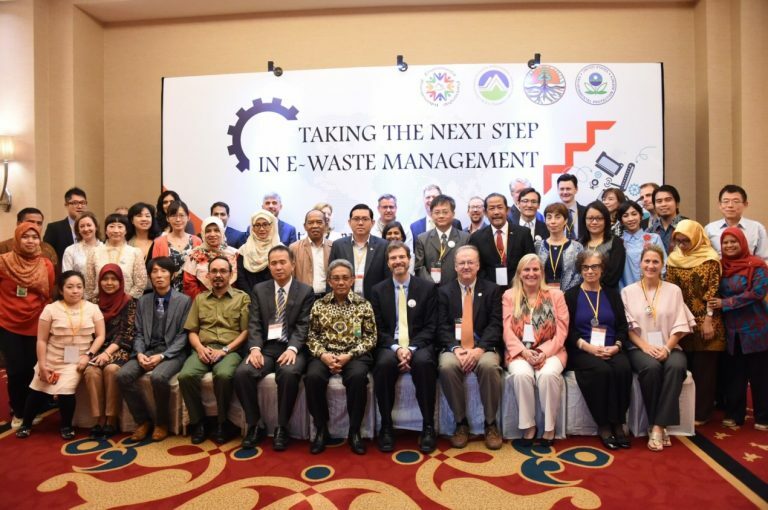 The U.S. EPA, Taiwan’s EPAT and Indonesia’s Ministry of Environment and Forestry co-hosted the seventh annual meeting of the International E-Waste Management Network (IEMN) from October 2-6, 2017 in Jakarta, Indonesia. 50 participants from 19 countries in Asia, Africa, the Americas and Europe representing both government and nom-government sectors shared their experiences of e-waste management. The first day of the IEMN meeting commemorated Indonesia’s Batik Day on October 2 with a series of lectures that purely focused on Indonesia’s e-waste challenges. The next four days saw all international representatives share ideas about future e-waste policies and new technologies available. A representative from the International Finance Corporation was invited to the meeting and outlined various ways to obtain financing for recycling projects.